Classic Solar Cross in Celtic Knot work accented with Garnet/Blood Ruby simulated gemstones. Antique finish incorporating both Gold and Silver to represent the God and Goddess. A cast polyresin 3D cover makes this journal really eye-catching. 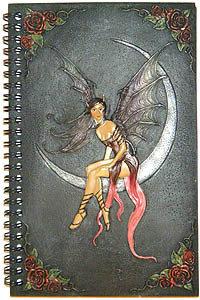 You can use it as a diary or book of shadows. It contains 50-60 sheets of paper. Size is about 5 inches by 8 inches. A beautiful Gothic and Celtic Cross with silver accents. A cast polyresin 3D cover makes this journal really eye-catching. 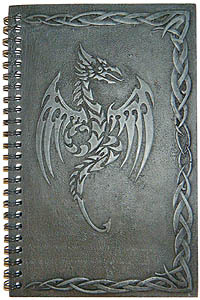 You can use it as a diary or book of shadows. 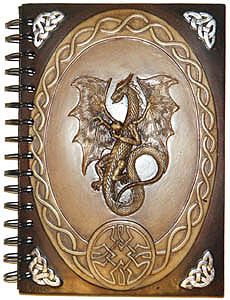 A cast polyresin 3D cover makes this Tribal Flying Dragon Journal really eye-catching. 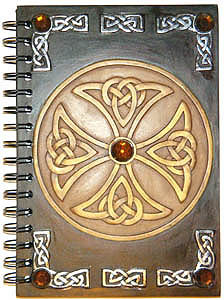 It even has a polyresin back cover, with 3D Celtic knots! You can use it as a diary or book of shadows. A truly elegant Dragon! The antique finish is emphasized by the silver Celtic Knots in each corner. A cast polyresin 3D cover makes this journal really eye-catching. You can use it as a diary or book of shadows. The Pentagram - classic and traditional. This Pentagram is adorned with a top and bottom border of Celtic Knot work. A cast polyresin 3D cover makes this journal really eye-catching. You can use it as a diary or book of shadows. Beautiful dark-haired Fairy sitting on a silvery slice of the Moon. This cover has full color to detail everything from her delicate wings to the red roses in each of the four corners. A cast polyresin 3D cover makes this journal really eye-catching. 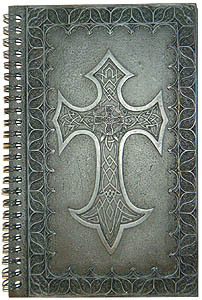 You can use it as a diary or book of shadows. 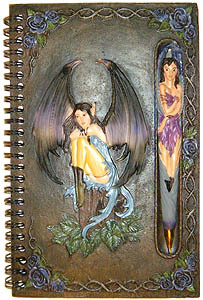 Two beautiful Fairies grace this journal. One on the antique cover and one as the pen for your magickal writings. A cast polyresin 3D cover makes this journal really eye-catching. 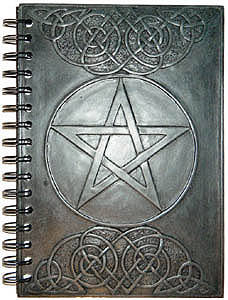 You can use it as a diary or book of shadows. It contains 50-60 sheets of paper, and this one even comes with a pen. It attaches to the journal with a strong magnet for safekeeping. Size is about 5 inches by 8 inches.